THIS TESTING IS NOW CLOSED!!! I'm currently looking for people who are interested in testing my "Bloomers" (#23001) sewing pattern before making it available for purchase. 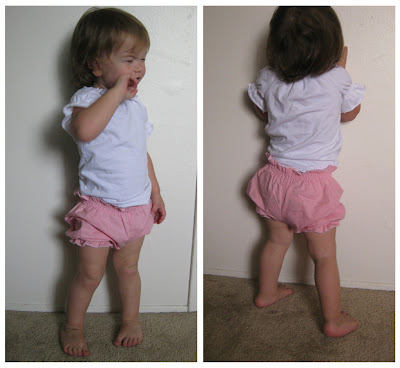 Description: Bloomers [diaper cover] with elasticized waist and leg openings allow for easy on and easy off with enough stretch to cover the diaper. Reversible, which makes dressing wiggly babies even easier! Pair them with a onsie or a perfect addition to a matching top or under a dress or skirt. Leave the elastic off the leg openings and they are the cutest shorts. 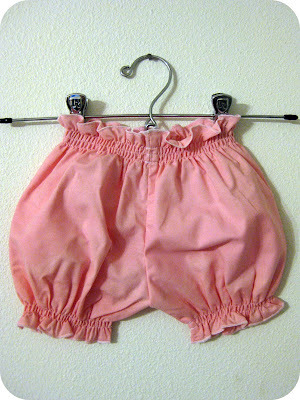 Instructions for three different elastic techniques (shirring using elastic thread, classic elastic casing and ruffled elastic casing). You will receive 4 pages of patterns and 11 pages of instructions, including 28 steps and 37 pictures to guide you along as you make it. can i test but can i have 2 weeks? inlaws in town this next week. if that works i want 3m. and if you need me to do 2 i can do 2t as well. i can do 6m. and have them done by a week from tuesday. the bro in law leaves this tuesday morning. i can also do 9m if not claimed already. I would like to make the size 3T please flower_randi219@hotmail.com Thank you!